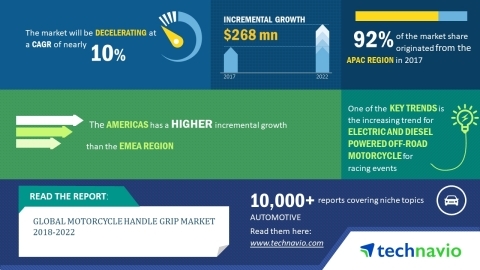 LONDON--(BUSINESS WIRE)--The global motorcycle handle grip market is expected to post a CAGR of close to 10% during the period 2018-2022, according to the latest market research report by Technavio. However, the growth momentum of the market is expected to decelerate due to a decline in the year-over-year growth. A key factor driving the growth of the market is the increased demand for motorcycles in APAC. APAC is a major market for motorcycles, and India, China, Thailand, Indonesia, and Vietnam are the major motorcycles markets in the region. During 2016-2017, India displaced China as the top two-wheeler manufacturer in the world after selling close to 17.5 million motorcycles. Factors such as increasing urbanization, better road conditions, and increasing acceptance of two-wheelers by women are increasing the demand for two-wheelers in APAC. Moreover, reducing the fuel process and customer-friendly interest rates for purchasing a vehicle are also contributing to the demand for two-wheelers. This market research report on the global motorcycle handle grip market 2018-2022 also provides an analysis of the most important trends expected to impact the market outlook during the forecast period. Technavio classifies an emerging trend as a major factor that has the potential to significantly impact the market and contribute to its growth or decline. The need for reducing CO2 emissions has led to the introduction of electric off-road motorcycles. The major limitations for the production development of an electric motorcycle for off-road was the lack of availability of a lightweight battery with high power storage capability. Considering the growth prospects, various manufacturers have launched electric endure motorcycles. Such launches are expected to increase the product awareness among consumers and consequently increase sales. Moreover, restrictions on the use of fossil fuel powered vehicles in cities in nature reserves will drive the adoption of electric motorcycles. “Apart from the growth of electric off-road motorcycles, there is an increasing demand for off-road diesel motorcycles. Defense agencies have started adopting diesel powered off-road diesel motorcycles, and the motorcycle manufacturers are offering diesel motorcycles to cater to the demand,” says a senior analyst at Technavio for research on automotive components. This market research report segments the global motorcycle handle grip market by application (commuter and mid segment and premium segment) and geographical regions (APAC, EMEA, and the Americas). The commuter and mid segment held the largest market share in 2017, accounting for nearly 59% of the market. This application segment is expected to dominate the global market throughout the forecast period. APAC led the market in 2017 with a market share of nearly 92% of the market share. The market share occupied by this region is anticipated to decrease during 2018-2022. The global motorcycle handle grip market is expected to post a CAGR of close to 10% during the period 2018-2022, according to Technavio.